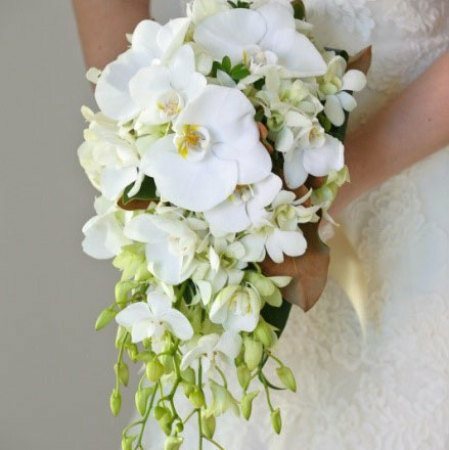 A teardrop bouquet featuring phalaeonopsis orchids, singapore orchids and little gem magnolia leaves for the bride, and a small or medium clustered posy for the bridesmaids to match. Simple, classic, timeless. Wedding bouquet handles wrapped either as `gripbound` or fully covered in white or ivory satin or organza ribbon. Optional bridesmaid bouquet handle either `gripbound` or fully covered in a satin or organza ribbon to match dresses (please specify preferences and ribbon colour details in the `Special Delivery Instructions Box`). Order Cut Off: Minimum seven working days prior to wedding to ensure availability of chosen blooms.